of the PC market right now. 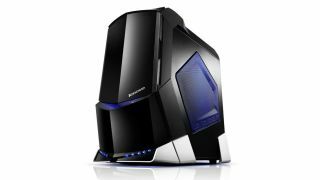 The company reported its PC shipments were up 10.2 per cent, compared with the 8.1 per cent decline the rest of the industry has suffered. Lenovo's impressive performance was repeated across its entire portfolio, with total sales seeing a 15 percent increase from the prior year. Nice going, guys. Its ever-increasing PC market share in the US meanwhile peaked at 15.3 per cent, which puts it almost neck and neck with HP. Of course, Lenovo isn't just focused on PC sales. In January it unleashed an assault on the market by announcing six new smartphones, and the company has said it will be strongly focusing on the smartphone arena as it moves forward. As with PC sales, its biggest smartphone market is in China, where it's implemented an aggressive marketing strategy to take on Samsung as the leading provider, to which it's second to. CEO Yang Yuanqing commented: "Smartphone shipments were 3.7 times greater than last year globally, and we are now number two in the China smartphone market." "This has laid a solid foundation for the successful transformation of Lenovo into a PC Plus leader."